There is a freshness in clothing once you take them out of the laundry. The incubation period of your second skin swirling around in the machine. Digesting, cleaning, rebuffing, out with the old as they say. Textures change, wrinkles stay and then get steamed, bleached by the sun and time. It is of you, it is from you, it is for you, and new to us. Never before seen, heard, performed. It has been washing, twisting, churning in our stomachs, minds, eyes, hearts for many moments now. 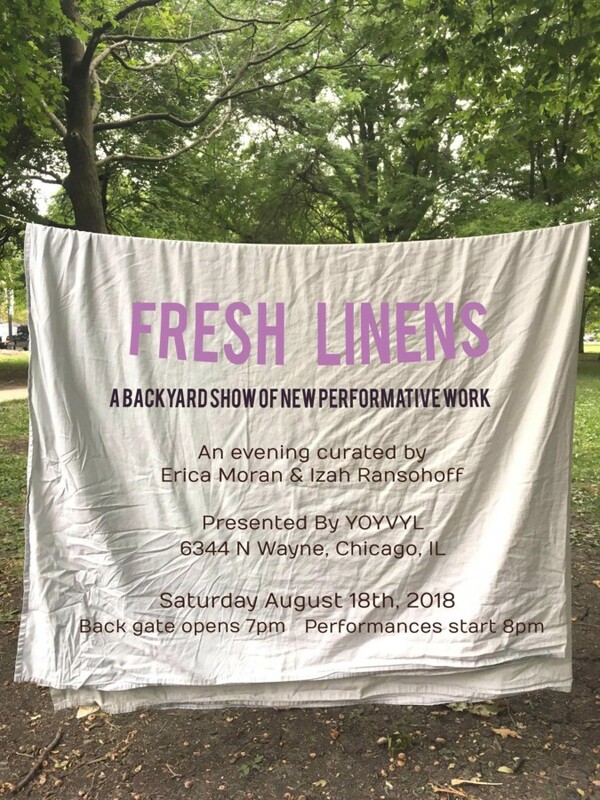 Presented by YOYVYL, curated by Erica Moran and Izah Ransohoff. Yard opens at 7. Performances promptly at 8pm. Party to follow afterward inside the building. The yard is wheelchair accessible, while the building is not unfortunately.